(Bloomberg) — A South African panel that spent four years investigating allegations of corruption linked to about 46.7 billion rand’s ($3.3 billion) worth of weapons purchased in the late 1990s found no evidence of wrongdoing by politicians or government officials. “The commission found the evidence presented before it does not suggest that undue or improper influence played any role in the selection of the preferred bidders which ultimately entered into contracts with the government,” President Jacob Zuma said Thursday in a nationwide broadcast. The panel found the purchase of the weapons to be justified, said they were being used properly and recommended no further action, he said. The purchase of jets, warships, helicopters and submarines from companies including ThyssenKrupp AG and BAE Systems Plc has been dogged by graft allegations since it was agreed to in 1999, with accusations of wrongdoing by officials including former President Thabo Mbeki. 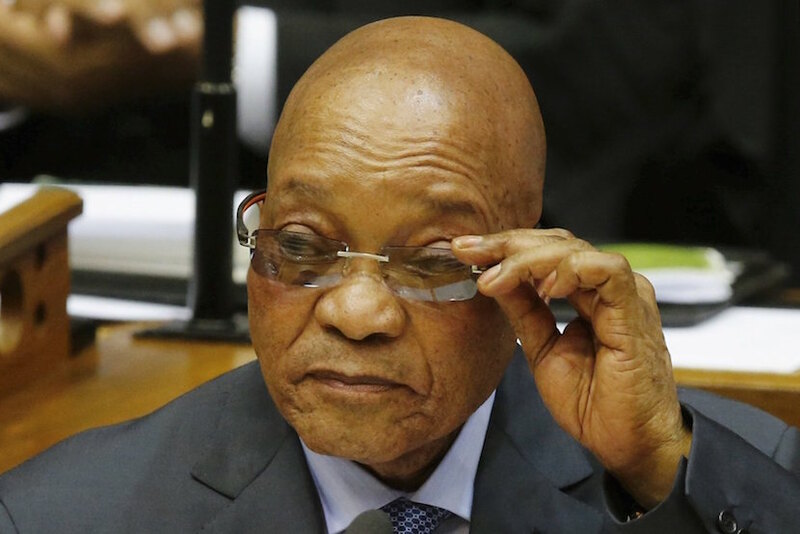 Zuma established the panel headed by Judge Willie Seriti after anti-arms campaigner Terry Crawford-Browne sued the government in 2011 to revive an investigation, arguing that the state failed to meet a constitutional obligation to fight corruption. Mbeki, ex-Finance Minister Trevor Manuel and former Defense Minister Mosiuoa Lekota, who were among 54 witnesses who testified at the hearings, denied knowledge of wrongdoing. The panel’s credibility was questioned after two of the three judges originally appointed by Zuma and several officials quit. The commission failed to consider millions of pages of evidence collected in previous investigations or properly interrogate witnesses, Crawford-Browne said. The government spent the money over a period of 14 years, excluding financing costs, according to the National Treasury. The cost may have reached as much as 70 billion rand after taking into account debt payments and the currency’s depreciation, according to the Cape Town-based Institute for Accountability in Southern Africa. While there were several previous official probes of corruption in the weapons contract, only two people have been convicted in South Africa on related charges. In 2003, Tony Yengeni, a former lawmaker for the ruling African National Congress, was found guilty of defrauding parliament by failing to disclose a discount on a luxury car from one of the companies bidding for the arms contract. 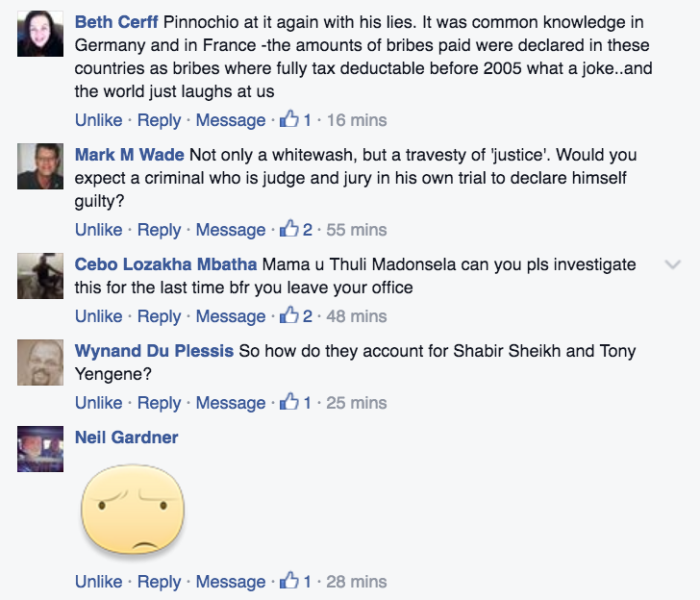 In 2005, Zuma’s then-financial adviser, Schabir Shaik, was convicted of trying to solicit a bribe for the politician. A police investigative unit known as the Hawks halted its probe in 2011, saying it was unlikely to secure further convictions. BAE, Europe’s biggest defense company, agreed in February 2011 to pay almost $450 million in fines to resolve bribery and fraud investigations by U.S. prosecutors and the U.K.’s Serious Fraud Office relating to deals in six countries, including South Africa. In June 2008, German state public prosecutors dropped a two-year bribery investigation of ThyssenKrupp, Germany’s largest steelmaker and was part of the group that supplied four frigates to the South African navy. Various calls were made since early 2000 for the establishment of a Commission of Inquiry to investigate allegations of wrongdoing in the Strategic Defence Procurement Packages. Around November 2010, legal proceedings were instituted in the Constitutional Court for direct access. The applicant in that matter asked the court, amongst others, to declare that the President?s failure or refusal to appoint an independent commission of inquiry into allegations of irregularities, fraud and corruption in the Strategic Defence Procurement Packages, which the applicant refers to as the ?arms deal?, was inconsistent with the Constitution. He asked for an order directing the President to appoint within 10 days an independent commission of inquiry under section 84(2)(f) of the Constitution read with the Commissions Act, 8 of 1947, to inquire into allegations of wrongdoing and to report publicly thereon. On 12 September 2011, I filed an affidavit in response to the application, wherein I set out that despite not conceding any of the contentions advanced by the applicant, I had decided to appoint a commission of inquiry. On 24 October 2011, I appointed the Commission of Inquiry into Allegations of Fraud, Corruption, Impropriety or Irregularity in the Strategic Defence Procurement Package (also known as the Arms Procurement Commission). The Commission was chaired by Justice Willie Seriti of the Supreme Court of Appeal, Judge Hendrik Thekiso Musi, then Judge President of the Free State High Court; and Judge Francis Legodi of the North Gauteng High Court. Judge Legodi resigned a few days before the Commission was to start public hearings, and the two judges continued with the work. The final report, which consists of three volumes, was delivered to me on 30 December 2015. I undertook to process the report and in due course, make further communication on the matter. Having considered the contents of the Report and the findings thereof, I have taken a decision to release the three volume report to the public. – Whether any contract concluded is tainted by any fraud or corruption capable of proof, such as to justify its cancellation, and the ramifications of such cancellation. The Commission conducted its inquiry for a period of four full years, exceeding the two years it had been initially given to do the work. The inquiry involved conducting private investigations and interacting with entities and persons with knowledge of the Strategic Defence Procurement Package. Public hearings took place between 19 August 2013 and June 2015, and fifty-four witnesses appeared before the Commission. The key witnesses included Former President Thabo Mbeki and former Ministers of his Cabinet. Serious allegations had been made by individuals in the media that investigators abroad had collected evidence of wrongdoing in the Strategic Defence Procurement Package linked to some of the winning bids. To verify these assertions and obtain the evidence that had been gathered, the Commission undertook visits to the United Kingdom, Sweden, France, the United States of America, Switzerland, Germany and Liechtenstein. 1. On the rationale for the package, the Commission found that it was necessary for the South African National Defence Force to acquire the equipment it procured in order to carry out its constitutional mandate and international obligations of peace support and peace-keeping. 2. On the question of whether the arms and equipment acquired are under-utilised or not utilised at all, the Commission found that all the arms and equipment acquired are well-utilised. 3. On whether the job opportunities anticipated to flow from the Package have materialised, the evidence tendered before the Commission indicated that the projected number of jobs to be created through the arms procurement process was achieved. The Commission states that the probabilities are that the number of jobs created or retained would be higher than eleven thousand nine hundred and sixteen. 4. On whether the off-sets anticipated to flow from the arms procurement have materialised, the Commission found that it was fair to conclude that the anticipated offsets have substantially materialised. Adequate arrangements are in place to ensure that those who have not met their obligations do so in the immediate future. 5. On whether any person or persons improperly influenced the award or conclusion of any of the contracts in the procurement process, the Commission found that the evidence presented before I,t does not suggest that undue or improper influence played any role in the selection of the preferred bidders, which ultimately entered into contracts with the Government. 6. On whether any contract concluded through the procurement process is tainted by any fraud or corruption, the Commission states that the widespread allegations of bribery, corruption and fraud in the arms procurement process, especially in relation to the selection of the preferred bidders and costs, have found no support or corroboration in the evidence, oral or documentary, placed before the Commission. No evidence was found as well through the Commission’s own independent inquiries. The Commission also probed the engagement of consultants by some of the bidding companies. The Commission points out that the large payments made to consultants gave an impression that the money may have been destined to decision makers in the arms procurement process and that they may have been bribed. The fact that some of the consultants knew or had personal contact with some of the senior politicians in the government of the day, was cited as corroboration. On this point, the Commission states that not a single iota of evidence was placed before it, showing that any of the money received by any of the consultants was paid to any officials involved in the Strategic Defence Procurement Package, let alone any of the members of the Inter-Ministerial Committee that oversaw the process, or any member of the Cabinet that took the final decisions, nor is there any circumstantial evidence pointing to this. The Commission states that the preferred bidders confirmed that the money was for the consultant’s services and nothing else. Some of the individuals implicated in the allegations of wrongdoing gave evidence before the Commission and refuted the allegations and insinuation levelled against them. None of them was discredited as a witness. Members of the Inter-Ministerial Committee that oversaw the whole process and recommended preferred bidders to the full Cabinet, which approved the recommendations unaltered, have given evidence before the Commission and refuted any suggestions that they may have been bribed or unduly influenced in any way whatsoever to take the decisions they took. None of them was discredited as a witness. The key members of the technical teams that conducted the extensive evaluations of all the offers, gave evidence and refuted any suggestion that they may have been unduly influenced or any way manipulated to produce the relevant scores or rankings. None of them was discredited as a witness nor was there any credible evidence placed before the Commission to refute their testimony. Other than the Lead-in Fighter Trainer (LIFT) programme, the Inter-Ministerial Committee accepted, unaltered, the results of the evaluations produced by the technical teams and recommended to the full Cabinet, the preferred bidders identified by the technical evaluations. Where the cabinet took a different decision, for example the selection of the BAW Hawk aircraft for the LIFT programme, they gave full reasons of the strategic nature for this decision. Moreover, says the Commission, there was no evidence that such decision was tainted by any improper motives or criminal shenanigans. There was also no basis whatsoever for disbelieving the evidence submitted by the members of the Inter- Ministerial Committee in this regard. The Commission concluded by stating that there was no room for it to draw adverse inferences, inconsistent with the direct, credible evidence presented to it, in respect of all material aspects of the Terms of Reference. Government had been of the view that any findings pointing to wrongdoing should be given to law enforcement agencies for further action. There are no such findings and the Commission does not make any recommendations. I wish to express my sincere gratitude and appreciation to the Chairperson of the Commission, Judge Seriti as well as Judge Musi for the professional, efficient and effective manner in which they conducted the Commission. We also wish to thank the evidence leaders, the legal teams, all the witnesses, staff members of the commission and all those who contributed to making the work of the Commission a success.